An appallingly ugly box (built 1959) crammed next to a handsome Late Victorian home (built 1907), at the northwest corner of Summit St. and E. 14th Ave. Whoever did this had no soul. In the middle 1960s, the Baby Boom began arriving at Ohio State University. Students came by the thousands. In 1960, Ohio State Main Campus enrollment was 23,813 students. By 1970, it was 46,074. Enrollment almost doubled from 1960 to 1970. In the 1970s, enrollment continued to climb, peaking at 54,462 in 1980. All of these students needed some place to live. Hence, the boxes. Shutters on the door? A box on E. 12th Ave near Indianola. Built 1965. The lone bush almost hides the gas meter. A box on Summit. Built about 1970. A small, pointless, minimally maintained greenspace in front. Windows (aluminum sliders usually) regularly spaced, disproportionately small. Non-functioning shutters are sometimes added to conceal this. Utter inattention to concealing things like gas meters, wires, vents, satellite dishes, downspouts, cable boxes, air conditioners, etc. The boxes were built quickly and inexpensively to house as many students as possible (and generate as much rent as possible) on the land available. The only reference to history or setting they expressed was the size of the lot and the proximity of large numbers of potential student renters. The investors who funded their construction often never saw them or cared to. They were a line item on a balance sheet for an investment group of Toldeo dentists or some teachers' pension fund. Dismal. Highland Ave. Built 1964. Building and renting ugly boxes must've been very lucrative. The University District and surrounding neighborhoods have scores of them. Although they are densest in the student core area between 11th and Lane from High St. east to Summit, they are found all over. There is scarcely a block in the University District that doesn't have at least one of them. E. 12th Ave. Built 1960. There's much more commerce than art in the design of these buildings but, were one to be generous, there are hints of then current architectural styles. The period was the high point of the International Style. Ego-mad architects pissed all over millennia of tradition and erected appalling steel and glass slabs as monuments to their theories. In the ugly box apartments, one can see the minimalism, boxiness, rectilinear forms, brutal functionalism, forsaking of ornament, contempt for proportions, and disdain for history, culture, geography, and climate of that school of design. They are fine examples of that style's basic inhumanity. There's also something of Levittown in these buildings. The post-war decades were the era of tract housing and suburban sprawl. Like the tract housing sweeping over former fields beside the interstate, these apartment buildings were small, boxy, stripped down, and cheaply constructed. They were manufactured rather than built. Sameness was a virtue. The basic awfulness of these buildings was disguised with tacked on, counterfeit "homey" features--brick, stone, stucco, some faux Tudor beams, shutters, fireplaces, and porches--lifted from traditional houses. E. 13th Ave. Built 1973. 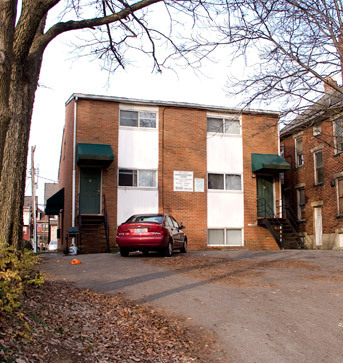 Many boxes have a paved parking lot for a front yard. Lovely. Despite this, many boxes do not have sufficient parking for residents so their cars spill onto the streets to compete for scarce spaces. E. 14th Ave. Built 1966. 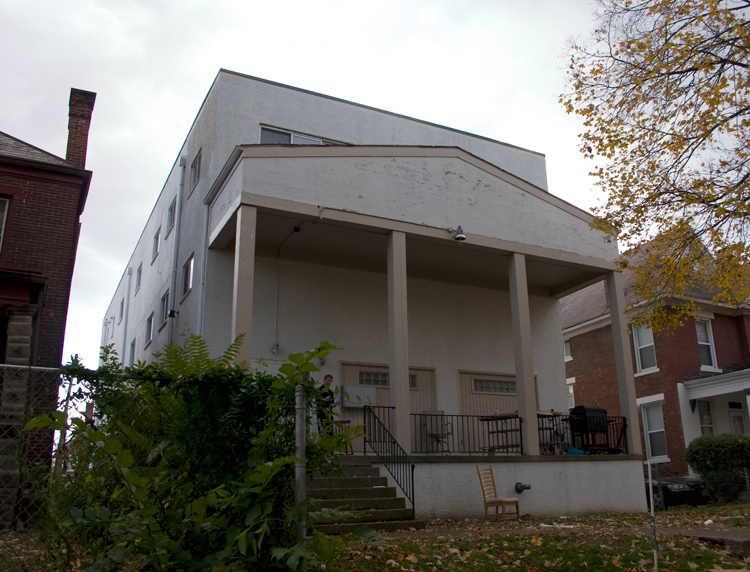 Metal porches and exterior stairs became a common feature of boxes built in the late 1960s-1970s. Never mind that these porches only had a view of a trash-strewn alley or the wall of another building. Interiors are about the same as the exteriors. Nothing special. 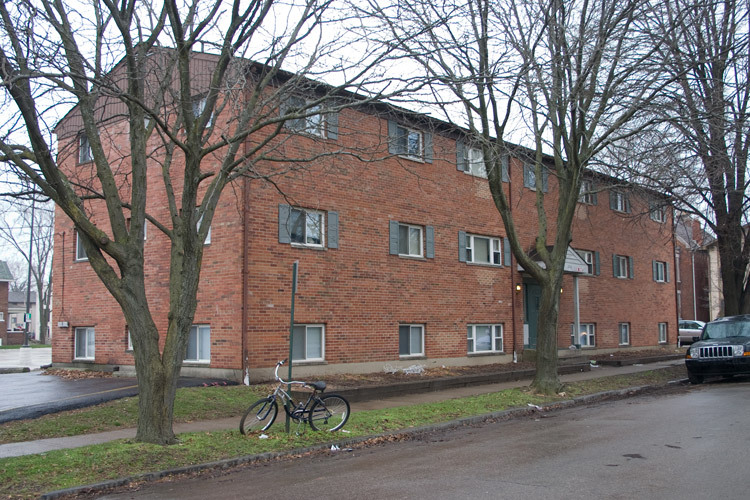 I lived in one of these my first year at Ohio State. It was cheap, it kept the rain off, it was tolerably warm in winter and tolerably cool in summer. The appliances and plumbing worked. Otherwise, it was aesthetically bereft, small, stripped-down with sloppily painted off-white walls, bottom-of-the-line fixtures, paper thin walls, and creaky floors. 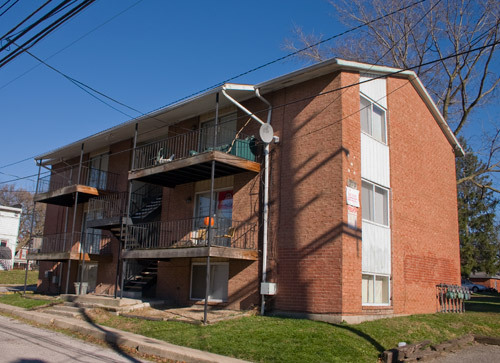 It was what it was: inexpensive, high-density, student housing. Ugly apartment building on E. 12th Ave. Built 1965. The porch just makes it sadder. Economics students will be familiar with the concept of externalities. For non-economists, an externality is a cost imposed by an economic activity that is not borne by the participants in that economic activity. Pollution is a classic example. A factory takes in raw materials, then manufactures and sells finished products. The price of the products and the profit received by the factory don't reflect the costs to society of poisons in the air and water created by the factory. Ugly boxes impose externalities. The buildings are objectively ugly, they degrade the streetscape, they mar the character of the neighborhood. They make neighborhoods less inviting for the owner-occupants who are the basis of safe, stable neighborhoods. They crowd too many people on too little land, creating parking problems, traffic congestion, litter, and noise issues. 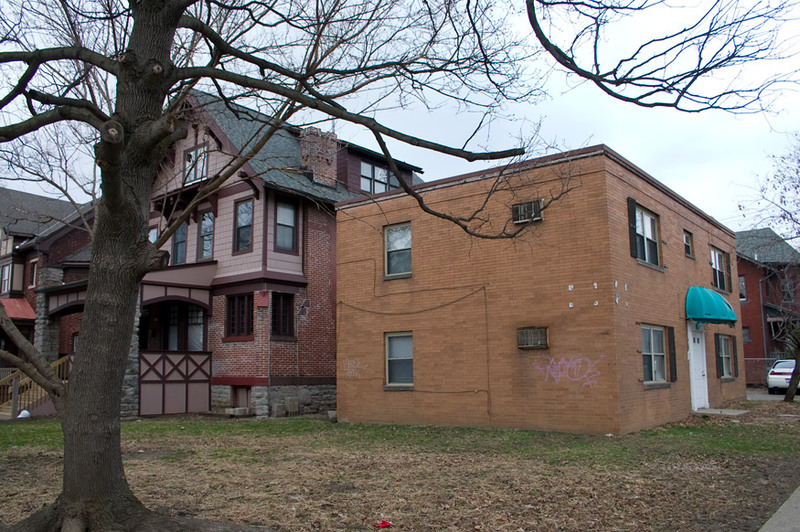 By creating an uglier, dirtier, less stable neighborhood, they invite crime. None of these costs are borne by builders, the mangers, the Toledo dentist investors group, or the teacher pensioners. In 2008, President Gee proposed that Ohio State sophomores be required to live on campus. Major construction is currently underway on expanded dormitories. 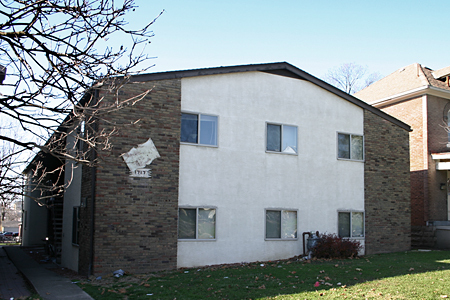 When the market for off-campus housing shrinks, rental companies will have to compete harder for student renters. 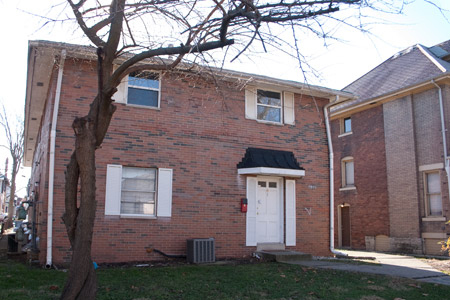 Student renters will be able to be choosier. Doubtlessly, the ugly boxes will fare badly. 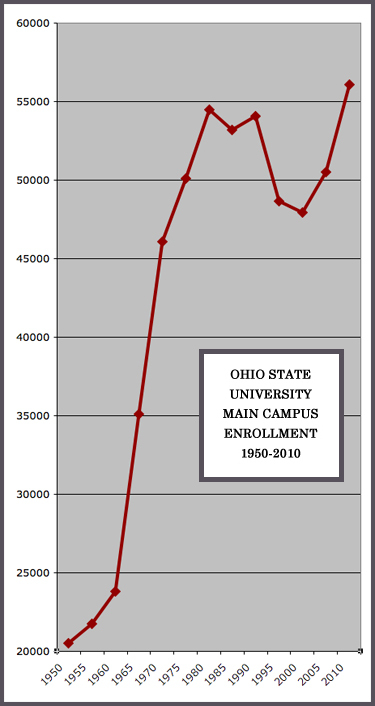 This happened previously in the 1990s when Ohio State enrollment took a decade-long dip. When students don't want them anymore, whither the ugly boxes? Perhaps property-owners will demolish them and build something more attractive. 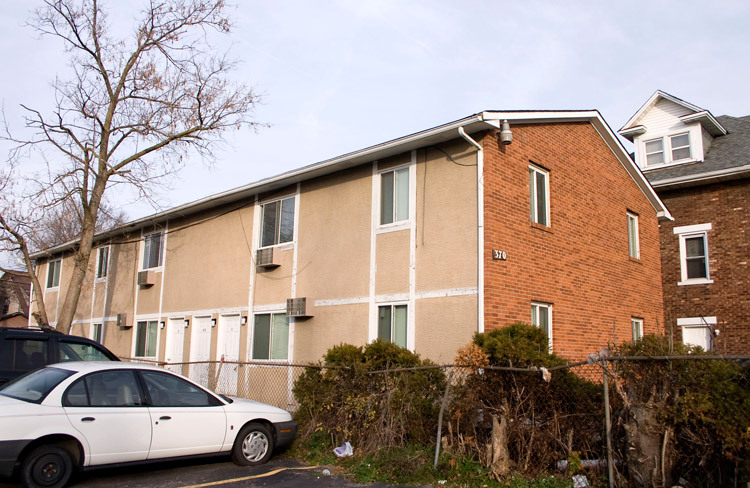 Perhaps the sites will return to owner-occupied housing. Perhaps the era of the ugly box is drawing to an end.